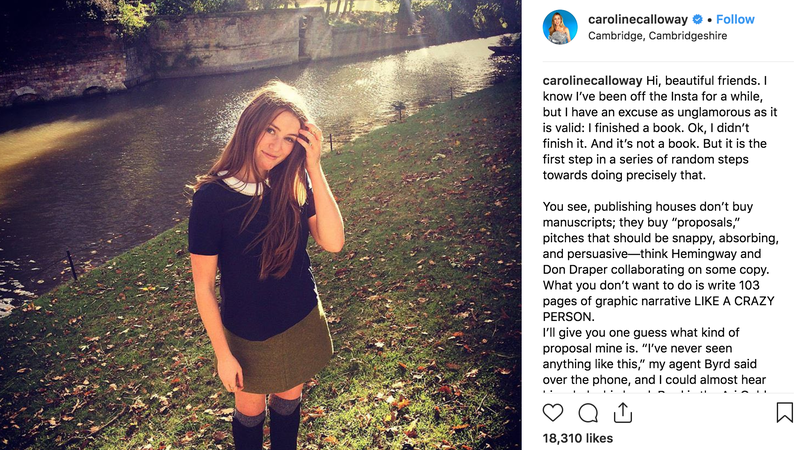 Over the weekend, a Twitter thread created by journalist Kayleigh Donaldson followed Instagram influencer Caroline Calloway’s attempt at organizing a $165, four-hour seminar tour (one hour in which she would not be present) to educate fans on how to “be yourself.” Calloway has 829,000 followers, which is apparently enough to garner real interest in her self-help class that offered participants indelible skills, like how to make an orchid flower crown. Calloway’s seminars, like many social media master classes held by Instagrammers before her, quickly unraveled, revealing itself to be little more than a scam. As Donaldson documented, Calloway’s event shape-shifted from a real symposium to a stripped-down Fyre Festival-like meet and greet. She failed to book venues in towns she sold tickets for, releasing them within Eventbrite’s 30-day full refund window. She attempted to hire a videographer and photographer for free, then offered compensation, but only after a backlash. Those who actually made it to the few functional events sat on the ground and ate lettuce (originally marketed in an expired Instagram story as a salad “cooked” by Calloway herself) during a snowstorm to hear her regale them with her tales of influence, presumably skipping over the $100,000 book advance she was given for a memoir based on her Instagram, the very same she ended up not writing. Or that she blew the money, was sued by the publisher and later, sold pages of the book proposal on Etsy at almost $7 a chapter. For influencers like Calloway, performative online identities are a commercial for an easily marketable, aspirational lifestyle reserved exclusively for people like her: the well-to-do and often attractive. That the engagement she receives on a pleasing photograph or Instagram story doesn’t translate to an IRL event only confirms the mythology inherent in influencing: She’s in the business of selling an image inaccessible to most of the people who crave it, something she herself couldn’t realize outside the boundaries of Instagram. Of course, Calloway is only one example in a long history of social media users invested in monetizing themselves. Fashion and beauty personalities across platforms like Instagram and YouTube have, for years, used their popularity to shill stuff. Michelle Phan, one of the original BeauTubers, built an entire career from posting tutorials online that eventually led to deals with Lancôme and her face in a Dr. Pepper ad posted all over the New York City subway. Chiara Ferragni and her immensely popular fashion blog The Blonde Salad migrated to social media, where she currently has 15.8 million Instagram followers. From it, she’s acquired massive brand deals, eventually leading to her own clothing and shoe line. It’s most common to see influencers (and Kardashian-Jenners) selling things they themselves probably don’t even use, such as dangerous-yet-affordable weight-loss products like detox fit teas and waist trainers, even Proactiv. They are accounts ready to sell to the highest bidder. And yet, the term “influencer” has been broadened so much, meant to encompass all of those different social media identities, that it’s been rendered meaningless. In 2013, Northeastern University student Marissa Mullen launched a Tumblr devoted to sharing pleasing pictures of cheese plates. The next year, she launched an Instagram account with the same ambition. According to a recent interview with Vox, Mullen said that she actively grew a following by searching cheese-related hashtags and liking every single image that used them. Her plan worked. Within the first year, she had around 5,000 followers—impressive, not necessarily enough to be called an “influencer” in today’s market, but enough to intrigue brands interested in investing in up-and-coming pages. In Mullen’s case, that meant a $100 gift card from Whole Foods, and the desire to continue growing her now two Instagram accounts: That Cheese Plate, which exclusively posts photos of cheese plates, and Cheese by Numbers, a step-by-step guide on how to create them. After six years of steady brand building, both accounts now have a combined 68,000 followers—small potatoes when compared to Calloway, or the few social media influencers who can score upwards of $20,000 - $60,000 for a single Instagram post. It’s a reminder that “influencer” is an increasingly arbitrary label. There is no specific barometer in which someone becomes an influencer because it’s largely a self-anointed term used by people who want to monetize their social media presence. There’s no metric that determines when an account is large enough to score brand deals or free stuff from major corporations. If Izea, a service that aims to help influencers create content for brands, is to be believed, an “influencer” has least 100,000 followers or subscribers. By that definition, people like Mullen are not influencers; they’re simply on Instagram. They could be considered micro-influencers, a newish term that refers to everyday people who hock toothpaste and face cream on their personal profiles, but even that might be misleading. Those accounts with less than 1,000 followers typically see engagement around 15 percent; the number decreases as the account grows, which is simple social science: those smaller accounts belong to our friends and families, and we tend to pay attention to the things our friends and family suggest to us. Mullen lives somewhere between the worlds of influencer and micro-influencer, but it doesn’t actually matter: she’s an influencer simply because she (and others) say so. For example, last month, she was invited on the Rachel Ray Show to promote her cheese-by-numbers system, which doubles as a step-by-step guide to leveraging social media for financial gain. (Just not that much money—Mullen told Vox her Instagram accounts only makes up about 10 percent of her overall income.) Instagram thrives on quirky, repetitive aesthetics and niche simplicity. But increased exposure doesn’t necessarily mean it’s influential; it simply means increased exposure. As the term “influencer” has become increasingly meaningless, those who work with established “influencers” have started to move away from the term. Last summer, Jack Bedwani, head of The Projects, a brand consulting agency, told The Atlantic that “The net is so wide, and the term ‘influencer’ is so loose,” when describing non-influencers identifying as “real” influencers in order to score complimentary hotel rooms. A few months later, The Atlantic ran another story about “influencers” faking brand deals in order to hopefully interest other brands to sponsor them in the future, specifically, luxury hotels. In that example, influencer hopefuls aim to convince brands of their sway and importance. They’re also aiming to convince their followers of what they see on the page, but those users may not care about the validity of the posts on the popular accounts they follow. Taylor Evans, for example, an aspiring influencer, faked an entire “press trip” to Miami: “I took a lot of pics at restaurants and posted ‘Thanks so much XYZ restaurant for the hospitality!,” she told The Atlantic. “You say it in a way that people could interpret it as you having an established relationship with that brand… The hope is that it’s perceived in a way that looks like there’s a reason you’re in a different city and state, not just enjoying a weekend vacation.” There’s a level of clout about bragging to the public about some luxurious free trip you acquired—even if it’s completely fabricated. In the most obvious sense, “real” influencers are conventionally attractive people who attempt to make good money while self-employed, hocking products they themselves don’t use or care about. Their posts are like a hyperbolic informercial, just bathed in better light, and with far better angles. While that holds true for those with popular social media accounts, there are still autonomous people behind those handles, making decisions about the kind of products or services they’ll attach themselves to. Calloway signed on to create a seminar—a glamorous, prohibitively expensive practice that looks and sounds good—regardless of whether it was practical or even possible. In her Vox interview, Mullen described a past Walmart sponsorship that angered her audience; her displeasure with the deal was not because she was using low brow cheese for her plates, but that her followers were upset. And of course, they were—Walmart is downmarket, it’s real life, and doesn’t conform to the near ubiquitous designer aesthetic of Instagram. That Cheese Plate’s success is based on an exclusive, expensive, aesthetically-pleasing image impossible to find at a big box retailer that markets itself as affordable. If anything, the danger of the ultimately meaningless “influencer” is not simply that they’re people, not corporations sold at any price—it’s that they confine influence to consumerist luxury. What&apos;s the Shelf Life of This Made-For-Influencers Apartment?